The Wizard of Oz may be almost 80 years old, but many of us know it to be one of the key films we watched growing up. The music is iconic, the Technicolor world of Oz was enchanting to behold and, of course, it was incredibly quotable. I mean, how many times have you told someone some form of, “Toto, I have a feeling we’re not in Kansas anymore”? Whether it was singing “Somewhere Over the Rainbow” or following our own Yellow Brick Road, the movie is still referenced with great affection to this day. It’s hard to imagine that filming this seminal film was anything but happy and magical, and yet, sadly, it seems there was more than one dark moment during this film’s production back in the late 1930s. Ever since it premiered back in 1939, rumors have circulated about the making of the film. 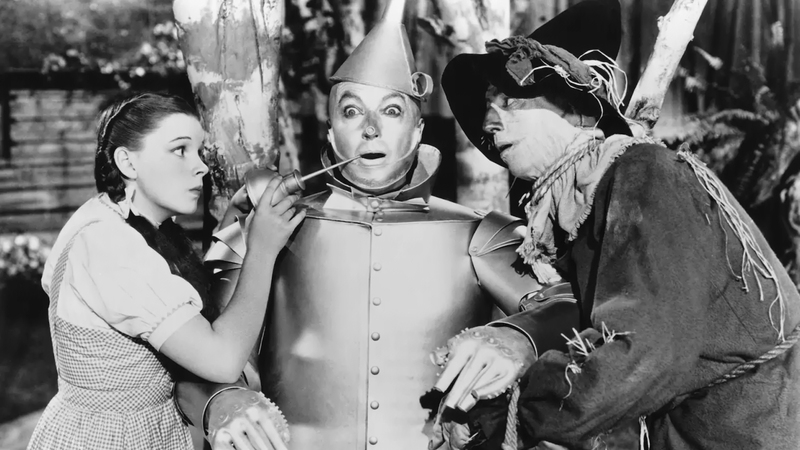 We’ve looked into the juiciest tidbits — including the fate of the first Tin Man and a possible suicide — to tell you what really went down on the set of The Wizard of Oz. It was the actor Buddy Ebsen (The Beverly Hillbillies) who started off as The Wizard of Oz producers’ choice to play the slightly melancholy Tin Man. The silver makeup used to make his character appear metallic was made out of aluminum powder. After 10 days of shooting and breathing the aluminum into his lungs, Ebsen became horribly ill. He was rushed to the hospital where he had to recover in an iron lung that helped him breathe. Jack Haley replaced Ebsen, but the filmmakers wised up and ditched the powder for an aluminum paste that was applied over greasepaint. Oz‘s director Victor Fleming, also known for directing Gone With the Wind, was rumored to be a Nazi sympathizer. Actor Anne Revere, who worked with Fleming in The Yearling, was quoted as saying Fleming was “violently pro-Nazi” and that he also loathed the British. From the giant mole on her chin to her creepy green skin, Margaret Hamilton made a frightening Wicked Witch of the West. While shooting a scene where the Witch disappeared in a puff of smoke, the special effects went haywire, and the oil-based green makeup caught fire, burning her hands and arms. She recuperated but refused to work with fire again. Turns out, it wasn’t only humans getting injured. Toto, the cairn terrier, Dorothy’s basket-size dog, suffered a broken paw when one of the witch’s guards accidentally stepped on its foot. The dog, a female named Terry in real life, went on to make a total of 15 films. More: How Well Do You RememberSpice World? In what could be an amazing coincidence or wild stroke of luck, the jacket purchased for Professor Marvel (Frank Morgan), was acquired at a secondhand store. The story goes that while Morgan was wearing the jacket on set, he noticed an inscription on the pocket. It read, “L. Frank Baum,” who was the author of the Oz books. It may sound fantastical, and it could be — the only record of the incident is from a studio publicist years later. The jacket was given to Baum’s widow, Maud Gage, after the movie was completed.